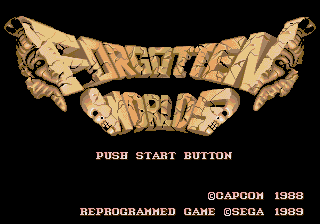 Forgotten Worlds (フォゴットンワールド), known as Lost Worlds (ロストワールド) in Japan original version developed by Capcom in 1988 for their CPS arcade system, is a shoot-'em-up ported to the Sega Mega Drive by Sega in 1989, and to the Sega Master System in 1991. The Master System version was not released in North America or Japan. Ports of this game are unusual in that Japanese releases use the export title of Forgotten Worlds, rather than the original Japanese title. Additionally, the Japanese Mega Drive release writes the "Worlds" part as "ワールズ" rather than the expected "ワールド" of other releases. You are a team of two guys (a white guy and a black guy; one-player mode has only the white guy) trying to stop a giant blue gorilla with gold jewelry from taking over the city. You use the D-pad to move your player around and to shoot (there is an Auto Fire option that makes this unnecessary). Shooting is done through a satellite gun that spins around you to aim; rotate in the appropriate direction with and . The Master System version had some stages removed and others combined into one; an underwater stage which did not appear in any other version is also present. It is one-player only and has the auto fire always on, with buttons and being used only to move the satellite clockwise and counter-clockwise. All versions have a shop system in which the player can purchase weapons or items by spending "Zenny", blue objects that can be used for currency. Shop items are mostly identical except for a few differences. For its time, the Mega Drive version of Forgotten Worlds was one of the most faithful home conversions of the arcade game, however still makes significant cutbacks to compensate for the simpler hardware. Background graphics in the Mega Drive conversion are almost entirely different to the arcade, and animations were simplified across the board presumably as a space saving measure. Fewer objects are on-screen at any given time, and there are slight differences in level design and enemy placement. Furthermore, all sampled speech in the game was removed. The Mega Drive version is also unusual in that it is one of the few Mega Drive games that have trouble handling 6-button controllers, including the Sega Nomad in its default 6-button mode. Attempting to play the game with a 6-button controller attached will cause immediate game overs. Main article: Forgotten Worlds/Magazine articles. NEC Retro has more information related to Forgotten Worlds.